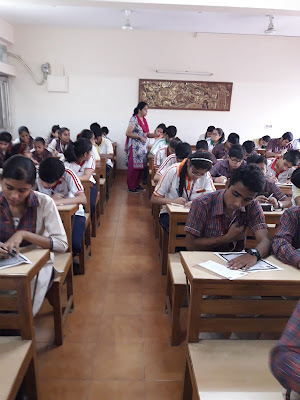 42 students from DLDAV Pitampura from classes VIII to X have participated in an online Quiz conducted by Petroleum Conservation Research Association (PCRA).It is a registered society set up under the aegis of Ministry of Petroleum & Natural Gas, Government of India. PCRA is a national government agency engaged in promoting fuel conservation and energy efficiency in various sectors of the economy. It also helps the government in formulating policies and strategies for petroleum conservation, aimed at reducing excessive dependence of the country on oil imports. Out of these 42 students two students Archisha Sharma of VIII A and Chehak Sharma of VIII A have been selected for District Level. On Monday 9th Oct 2017 DLDAV Model School Pitampura conducted Young Quotient Champion-Mindhour Quiz in collaboration with Times of India in which about 158 students from Grade 5 to 10 participated.